There’s nothing more annoying than being far away from home with no battery life left in your camera or phone. It’s sods law that at this point you’ll really want to capture some video footage from an incident, need to phone for recovery or just witness the perfect shenanigans to go viral on YouTube next. All of which are easily resolved with the addition of a USB power socket on your bike. It’s built pretty solid with an Aluminium housing. It’s got a funky flexible tube type design to provide some water resistance whilst in use. It’s got built in voltage sensor to auto cut out thus avoid flattening your battery and negating the need to faff about installing a relay. Lastly, at the time it was reduced to a tenner (from the rather expensive usual price for £25). Since it has auto cut out on low voltage, there was no need to wire it in via a relay to the ignition, side lights etc. This made installation a breeze, with just a single wire going straight from dash to battery. The voltage detected is shown by the LED light next to the sockets, which changes colour and flashes accordingly. The socket itself is a pretty solid affair with a nice Aluminium body. 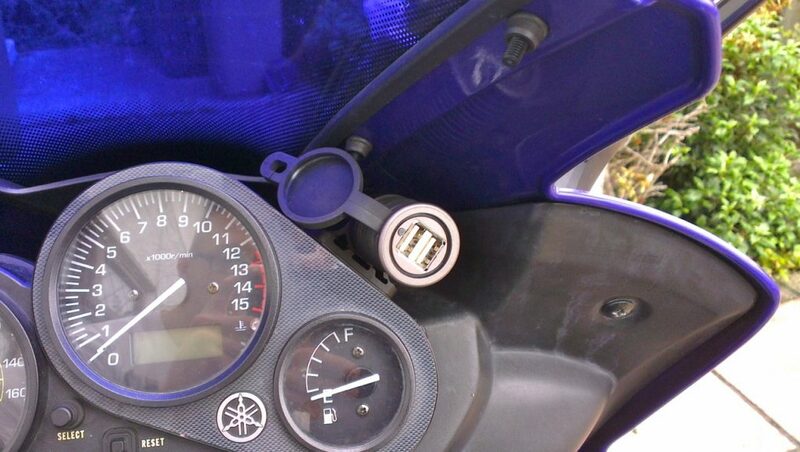 It came with a U piece for bolting direct to bars, but it also has double sides adhesive and a flat face, which I used to stick it to the clocks under my fairing. For weather proofing, there is a little rubber cap to cover the sockets when not in use. But when in use, there is a corrugated tube affair that can be yanked forward several inches to act as a rain shield to the sockets and USB plugs. Obviously not 100% waterproof, but this does work surprisingly well and I’ve had no issues thus far. Each USB socket will supply 2.1A which should power and charge up any device (even my fussy Drift Stealth 2 camera). However, on my Fazer it seems the voltage varies often judging by the LED light on it which never remains constant. This caused problems with a camera run in auto DVR mode, as it would stop recording every time the voltage dropped a little and the USB socket cut the power. I actually bought this last year and have been using it for some time now. Overall, it’s proved very handy on those long rides that have exhausted the batteries on my cameras. It’s stood up very well with no complaints on build quality or reliability at all. The only downside is the default price of £25, this is definitely a bit steep really.